1.6 Why is necessary to rinse the legumes after soaking before cooking? 1.8 How to cook legumes? 1.9 How long does it take to cook legumes? 1.10 Why cooking water must not have calcium? 1.11 How to make legumes more digestible? 1.13 How to improve the proteins of legumes? 1.14 How to chew legumes? Legumes are a food group whose nutritional value and digestibility depends on the way they have been prepared and cooked. Use the best legumes: Although dried legumes can stand up to half a year if they are kept in a tight and dry container, under the protection of light, as they get older they become harder and need to be cooked for longer, so it is better use younger and well preserved legumes. Store the legumes in good condition: It is important to keep legumes well at home to prevent molds from forming in foods that can be potentially harmful to the liver. This occurs when the vegetables are in open containers, with the heat and humidity of the kitchen, for many months. All this favors the formation of aflatoxins, toxins that produce molds, which are not visible to the naked eye or disappear by cooking, and which are carcinogenic and injure the liver. Once we have the appropriate legumes, we will place them on a sieve and we will remove them and check that they do not have any impurities like twigs or pebbles. Legumes of blackish or brown color should be removed, as this anomalous color is often indicative of contamination by bacteria or fungi. Later, we will place the sieve under the tap with cold water and clean them well. It is necessary to soak legumes before cooking them. Legumes should be properly hydrated before cooking. For this we will leave them to soak at room temperature during the previous night. 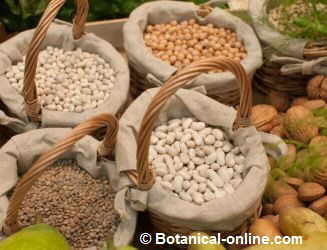 Legumes need to be soaked with water between 4-8 hours, or up to 12 and 48 hours in some cases. This time can be shortened if they are soaked in hot water. In other cases, such as fast cooking lentils, it is possible to have them between ¾ of an hour and 1 hour. Why is necessary to rinse the legumes after soaking before cooking? Legumes, after having been soaked, should be rinsed with plenty of cold water. In this way, we eliminate the indigestible sugars that have detached from the bark of the seeds during soaking. Once hydrated, they will be introduced completely in cold water so that water covers them perfectly. They will boil over high heat for about ten minutes. Then, we will stop cooking. We will remove the cooking water and we will add new one, slowly letting it cook for a long time. How long does it take to cook legumes? If cooked with a normal pot, cooking may take several hours. If a pressure cooker is used, time is extremely short. The second cooking water will be adequate and plentiful. Regarding the amount of water used, it is best to place in the container three parts water to one of pulses in the event of wanting to cook them; or five parts water to one water if they are intended for purees. Why cooking water must not have calcium? Cooking water should not contain much calcium or magnesium since these minerals are combined with legumin of legumes and they remain hard after cooking. The cooking water should not be salted, if we add some salt during cooking, it also hardens them. Salt can be added once they are cooked. Once they are sufficiently boiled and tender, it is important to properly remove water cooking. The following table shows the approximate cooking time of some species of legumes. Its value is not exact because the hardness of the same can vary considerably even within the same variety, so it is advisable to personally test if they are well cooked. How to make legumes more digestible? The practice of adding bicarbonate to vegetables is inadequate. The addition of this alkaline compound to water contributes to the destruction of vitamin B. In addition, adding bicarbonate spoils the taste of legumes. If we want the vegetables to be slightly softer, we can add a little olive oil to the cooking water. To increase digestibility, some vegetables can be skinned after cooking, as with dry fava beans. Others, such as soybean sprouts can be eaten or eat its derivatives such as tofu. Of all the legumes, lentils are those that are digested better. In order for them no to be so flatulent or to help the body expel flatulence, some spice or aromatic herb can be added to the preparation. There are many very suitable and easy to use, for example, cumin, bay leaf, thyme, parsley, savory, anise or fennel. One of the most appropriate ways to give flavor and take advantage of antiflatulent properties of spices and herbs is to put a bunch of herbs in a cloth inside the preparation. This must be removed from the pot after legumes are cooked. Paprika, red pepper, black pepper or curry can provide them with an exotic touch. Legumes are widely used in Indian cooking and the use of these hot spices usually accompany them in this country. How to improve the proteins of legumes? A suitable combination is to mix legumes with vegetables or, even better, with cereals that are also dietarily complementary. As vegetables do not need such long cooking, we must add them when legumes are half-cooked, or they can be added after cooking and sauté altogether lightly. Legumes perfectly match with onions, or chard. By contrast, it is not recommended to combine this food group with acidic foods like citrus (lemons, oranges, etc) or raw tomatoes to prevent the dishes to be indigestible. Neither vinegar is added to legumes preparations. For legumes can be digested well, they must be eaten properly. In principle they require to be chewed thoroughly, so as they can be crushed and salivated well. This process will encourage further digestibility. It is better to eat legumes whole than pureed or crushed. If prepared mashed, one tends to eat too much and in a short time. This implies too many calories and poor salivation, so legumes will not be well digested. In case of the elderly with teeth problems, they can use purees, considering that this group of people should eat this food group in a very moderate way. Also children should eat legumes moderately since they tend to swallow them without chewing enough.